Healthy Halloween Candy: What To Do? This year, Snack Girl is in serious trouble. Her annual trip to Target to find a healthy choice ended in defeat. One of the big problems was that my school district is now eliminating nuts because of allergies. This got me to thinking about what I should be handing out. Yeah, if I knew that getting our house toilet papered would be the worst of it I might buy these to hand out (hey we could always re-roll it and use it!) but the kids in our neighborhood like to throw eggs on cars which ruins paint. If I am honest with myself, prunes are a terrible idea. I am in dreamland if I think I will convince anyone to hand out prunes. 1. Don’t have nuts (those lousy allergies). 2. Won’t stick to kid’s teeth like taffy or other sticky candy. 3. Taste strongly so you aren’t tempted to eat too many of them in one sitting. 4. Not so bad on the calories. 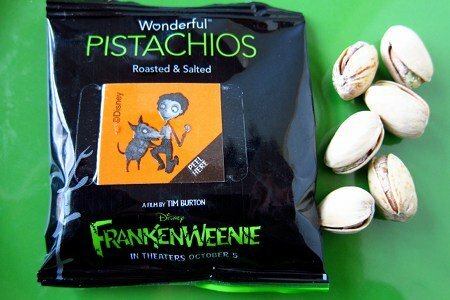 These aren’t going to get your house toilet papered or win any awards for healthiest Halloween treat – but they work in a pinch. I am going to get flamed for this, but this year I am flummoxed. Anyone find anything good to hand out this year? Please share. Points+ values are calculated by Snack Girl and are provided for information only. Looking For A Healthy Halloween Candy Option? Problem Solved! What about snack sized bags of pretzels? They cost about as much as a bag of Halloween candy. I fill my candy cauldron with both candy and bags of pretzels and let the kids decide. How about the small single serving bags of Skinny Pop popcorn? I usually do the regular candy, but last year I bought fingertip flashlights from Amazon and bought only half the amount of candy. Each child got 1 flashlight and 1 piece of candy. One of my neighbors gives the kids glowsticks instead of candy. Obviously if every house did a non-candy, non-food treat the kids would rebel, but I think some inexpensive non-food alternatives are fun. On the plus side I could see my kids down all the long driveways with the flashlights on their fingers. If cost is not an object- String cheese and mini boxes of raisins are food too. Sometimes you can but animal crackers in bulk at Sam's club or Costco. We live in the country so no trick or treaters! I think this looks interesting for all natural candy. Not sure if these are all that much more healthy but at least they aren't "candy". This year I'm handing out little snack bags of Goldfish Crackers, Pretzels, and Glow-in-the-Dark bags of Cheetos Crunchy. Thank you for suggesting an actual legit candy. Well played. One year I handed out pencils that had Halloween designs on them. The kids loved them. They had something to use at school. Maybe this is just one of those times when it might be ok to just enjoy something unhealthy for the day and not worry. Halloween used to be fun. Maybe setting time limits or portion control could be an easier way to maintain a modicum of healthiness. Last year I gave out mini cans of play dough. This year I am giving out rice krispie treats. U don't like the high fructose corn syrup, but I at least know it's not a treat that will "call to me" from the cupboard if there are any leftovers. Girl, I have to go with you! Peppermint Patties are the way to go. If I had to choose a candy that is what I would get. 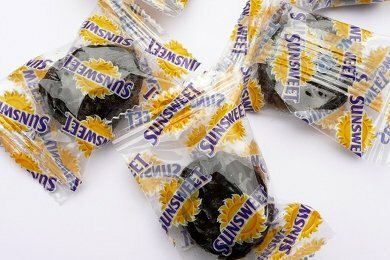 Prunes, ummm, not a great idea. I would be like what the heck is this, if I was a kid and ye, your house would get toilet papered. We give away Halloween pencils and vampire teeth. This year we are also giving away snackfuls and motts fruit/veggie treats 0 point+. It's surprising how many children choose the toys over the treats. Duckies! Oriental Trading has many varieties of these ducks. I have been giving out ducks for almost 10 years now. The kids love them. I have the repeat kids that will ask for a different duck, they know what they already have and so they want a different one to add to their collection. Nothing says it has to be a treat every time. We don't get many trick or treaters out our way, but we still buy a box of chocolate bars just in case. It's Halloween and portion is what we should teach kids. If we have any left overs, I put them in the freezer downstairs. That way I have to go out of my way to get them. Or I buy something I don't like or can't eat(gummies or marshmallows). Great topic!! They don't call you snack girl for nothing. For the people who wrote about non candy treats - u r my hero!!! I think the choc covered mints are perfect. I love dark choc cherries but they are hard to find. Just a confused question.. Are you eliminating nuts because there might be kids who are allergic who come trick or treating or did the school district tell you not to hand out treats with nuts? All my favorite candy has peanut butter! Love some of these alternate ideas. AH! We don't get a lot of kids in our (aging) neighbourhood, but we do get some - my challenge has always been to buy stuff that *I* won't eat. Turkish delight candy bars, for example. YUK. But non food items! I never thought of that! Glow sticks for all! 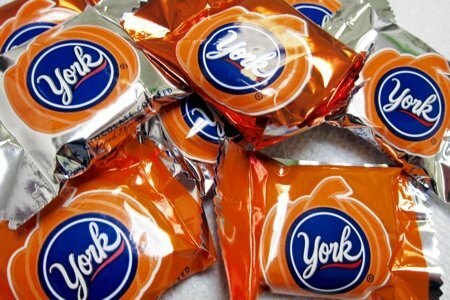 (York patties would never last in my house, I love those things ;-) Thanks everyone! We get so few children (if any) that I just make sure I have a cup of change -- kids like money. A friend gives out Halloween-themed bags of microwave popcorn, and the kids love them.